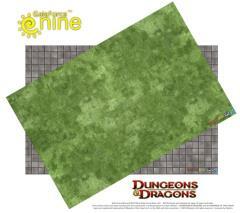 Gale Force Nine’s Official Dungeons & Dragons Dungeon Master’s Mat Set contains two vinyl game mats for staging your own encounters and adventures. One mat is a simple 1” grid of stone tiles, the classic dungeon environment. With this mat, a DM can mark walls, doors and other dungeon features using a wet-erase marker. This mat will be the staple battle grid for any indoor encounter. The other mat is a green grass field; ideal for staging outdoor confrontations. Like the other mat, a few quick marks from a wet-erase pen customizes the mat with whatever elements the encounter calls for. Add a tree line, forest path or campsite and let the battle begin. The Dungeon Master’s Mat Set is an indispensable tool for every DM! Gale Force Nine’s Game Mats are high-quality single-sided vinyl surfaces that are ideal battle grids for staging encounters. The mats lie flat for ease of play and are sold in a sturdy polycarbonate tube for easy storage and transport. The mats may be marked with WET-ERASE markers to temporarily alter terrain areas or make other notes about battlefield conditions during play. The Game Mats measure 20” x 30” and are marked with a 1” grid.